This is an example of how Salvador people dress like. Salvadorian people dress like this when there's a Holidays Such as Christmas this is a example of how little female girls will look like during Christmas time they also dress like this because some people want to take picture's to posted on the internet and they want to look very nice. This is another way how salvador people dress like. Salvador people Dress like this when there's a holiday such as Independence Day and this is how people will dress like when the day comes this shows that people wear traditional clothing for an event in El Salvador so that they can look nice and they represent their country too. 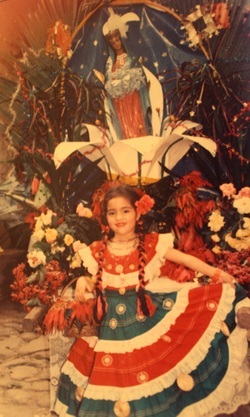 This is a traditional dress from El Salvador it has the salvador colors.If you plan to visit El Salvador, you may be concerned about what to wear. Because of the hot Caribbean climate of Central America, light fabrics and colors are preferred. Many of the traditional dresses and festive costumes worn by men and women of the past are only used on holidays and during national celebrations. 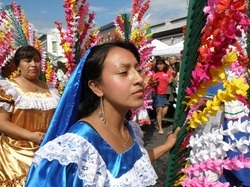 In their daily lives, people in El Salvador wear modest, casual clothing that is colorful and comfortable. 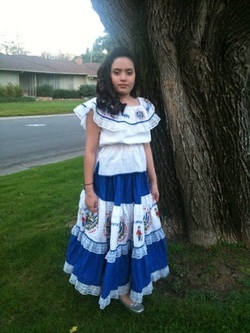 This is a traditional clothing of El Salvador. Not all people like to wear traditional clothing of El Salvador so they wear normal cloth such as short,pants and T-Shirts which mean that you don't have to wear traditional cloth in El Salvador you can just wear anything you want.